Water poses some risk to swimmers, but you might not be prepared for one of the most common problems. Getting water in your ears can cause uncomfortable and sometimes painful conditions within the ear, so those who swim often will need to figure out a way to keep this from happening. The easiest way to avoid any problems is to use the best earplugs for swimming. 16 Awesome Waterproof Fitness Trackers, Shop on Amazon‎, eBay, Walmart. 3 Are Earplugs Comfortable while Swimming? Water in the ears can cause infections, damage your eardrums, and may create a lot of discomforts. To avoid those problems, you’ll need to keep the water out of your ears. You can do it using specially molded swimming earplugs. 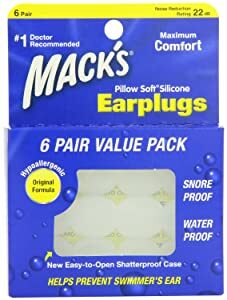 These are not the same as traditional disposable foam earplugs. The best swimming ear plugs are shaped to fit the inside of the ear and create a water-tight seal. Some swimmers go a step farther by wearing a headband around the ears to keep the plugs in place. 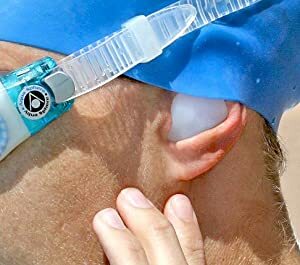 Some specially designed swimming goggles may also be able to accomplish the same thing, as long as they cover the ears securely to hold the earplugs in place. If you want to use a waterproof mp3 player, you’ll need special earplugs that are also headphones. The real benefit of using earplugs made for swimming is being able to avoid disease and injury. For younger children that have tubes in their ears from frequent ear infections, ear plugs are a must to avoid further infections. Anyone swimming in cold or dirty water can use earplugs to help avoid injuries and infection from the water itself. If you have a damaged eardrum, earplugs are necessary as well. 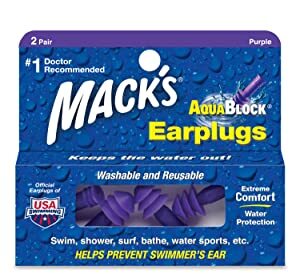 Are Earplugs Comfortable while Swimming? The biggest fear most people have is that their earplugs won’t be comfortable for swimming, or that they won’t stay in properly during physical activity. If you are willing to do your research and buy a good pair of earplugs, you are less likely to have any problems. 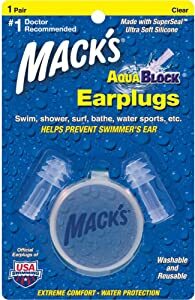 Not all earplugs were made for swimming, and there are different levels of quality available even for normal swimming earplugs. High quality earplugs are going to be made from watertight, yet pliable materials that will help you stay more comfortable. They will also stick in your ears better, even when you’re moving around a lot. If you opt to get a good pair, make sure you get the right size or a variety of sizes to have the best chance at comfort and useful function. Low quality earplugs are the ones that are likely to give you trouble. If they’re made from harder materials, the fit may be okay, but you won’t be as comfortable, especially while moving around a lot in the water. You might also find that they aren’t completely watertight, allowing small amounts of water through while you’re moving. Earplugs have to fit your ears in some water to become water tight. To know how effective they’ll be, you need to know how that watertight fit is created. Some ear plugs are customizable, allowing you to mold them into shape using heat. Others come with a designed shape in different sizes to fit various people. If you have any specific issues with fit, this is the best thing to look at, since you won’t be able to do much to change how an earplug fits. Some swimmers would suggest buying multiple earplugs of different types to see which ones have the right fit style for your ears. This is up to you, but it is a good way to determine what you may need when you buy again in the future. Some materials are better than others and more comfortable. Most are made from either silicone or wax, or some combination of the two. You might find hard plastic mixed in with extra components, but this plastic shouldn’t be touching the softer flesh within your ear. All earplugs have some level of noise reduction. The more water tight they are, the less sound they will allow in as well. If you want to still hear some sound while you’re swimming, there are earplugs designed to help with that, but they might not be as watertight as some other pairs. Those that want to block out noise will easily be able to find earplugs that block water and sound. There are both disposable and reusable earplugs. The most common types of earplugs for swimmers are reusable, with few disposables made for this same purpose. It’s easier, and usually cheaper, to wash and reuse the same earplugs over and over rather than throwing them out each time for a new pair. Reusable earplugs have more customization and improved features, plus they are more environmentally friendly. Disposable earplugs can be useful for the sake of hygiene. They can also be used by others, so you can share some of the disposables in your pack, instead of having a single set of reusable earplugs to use on your own. This is a set of 3 pairs of earplugs made from a soft, colorful silicone materials. You can easily mold the earplugs to fit into your ears. They are designed as a one size fits all product, so they can work for kids and adults of most ages. Putty Buddies use a tacky feeling silicone that holds onto the ears well while you’re moving around. The strong hold makes them a good choice for kids doing any activity in the water, whether it’s just swimming or something more intense like surfing or water skiing. For those doing exercise swimming or water sports, these are a good option. They’re designed to be sportier and to hold tightly even when you’re moving around a lot. All you do to fit them is insert them into your ear canal and twist to create a vacuum effect. This will seal the water out and help you keep your inner ears dry while you’re doing your workout. This particular set comes with 2 pairs of earplugs and a protective carrying case. Since these are washable and reusable, all you need to do is rinse them off after use and store them in the case for the best longevity. From Start Smart, this is a set of 2 moldable silicone earplugs and their carrying case. The material is designed to mold into shape on almost any ear, giving it a one size fits most quality. You can use these for kids and adults in most age groups. 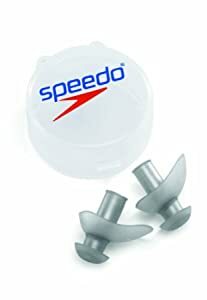 These earplugs aren’t as useful for intense activities and water sports, since they may come out with too much movement, but they do create a great watertight seal for regular swimming and exercising in the water. Made for use by water sports enthusiasts and active swimmers, these earplugs create a secure water lock that will keep water from your inner ear canal. They are pre-molded and don’t’ require you to try to fit them to your ear before wearing. Three flanges are used to clock out water, each one a little larger than the next to create a unique fit for each person using the earplugs. Most adults can wear these earplugs comfortably, but they may not work well for younger children, since they may be too large for smaller ears. There are no size variations, so if you are buying for a smaller child, you may need to look for a different option. These earplugs were well designed for water sports and activity. You can use them to do almost anything in the water without worrying about getting it in your ears. They’re comfortable to wear, and the ergonomic design helps them to stay in place easily. It’s quick and simple to put them on and to remove them when you’re done with your routine. Once you’ve finished swimming, you can rinse them off and store them in the included protective case. 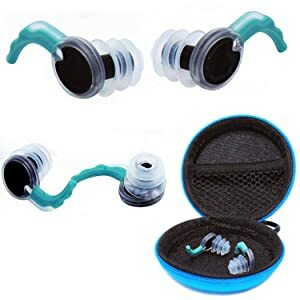 Silicone earplugs like these are great for use in the water by people in all age groups, because they will mold to the shape of your inner and outer ears for the best fit. These earplugs work well for swimming and other non-water activities when you simply need noise reduction. Kids can easily wear these moldable earplugs, and the size fits almost everyone in different age groups. They are reusable until they no longer hold onto the ears well. If you want an option that will still allow you to ear what’s going on around you and hold a conversation, these earplugs will do just that. They are designed to keep out water with a secure hold, but they do allow sound to come through, so you can hear things around you easily. Fixation wings on the back of the plugs help them to stay put while you’re moving about, or even when you have a bad wipeout in the water. Each pack comes with 3 different sizing options, so you can use them no matter what size you wear. 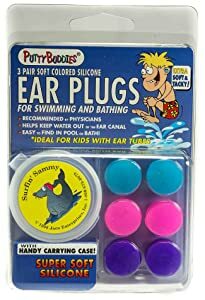 From the earplugs I’ve talked about above, I would like to recommend the PUTTY BUDDIES Original Swimming Earplugs as the best earplugs for swimming. They’re great all-purpose earplugs that work as one size fits all for people of all age groups. The silicone used is very soft and comfortable, so it won’t irritate your ears while you’re wearing them. These earplugs aren’t as ideal for active water sports like diving or surfing, but the sports earplugs designed for activity aren’t comfortable for everyone. Overall, the Putty Buddies tick the most boxes for the average swimmer (exercise or pleasure). You can also reuse them at least 5 or 6 times per pair, making them a decent choice for your wallet as well.